NETWORK UPDATE: AQUARIUS managed an 0.1 uptick in final numbers, but that was by virtue of the 1.4 it scored in its first 15 minutes–as we reported this morning, it had slumped to 0.9 for what turned out to be its final 45 minutes, and that probably gives a better picture of where it’s going. There was also a 0.1 rise for the BIG BANG THEORY rerun, but an 0.1 drop for the rerun of ELEMENTARY. CABLE HIGHLIGHTS: With no basketball or hockey playoff action, the night’s top slot went to LIP SYNC BATTLE on Spike, which jumped 0.31 from last week to 1.00. 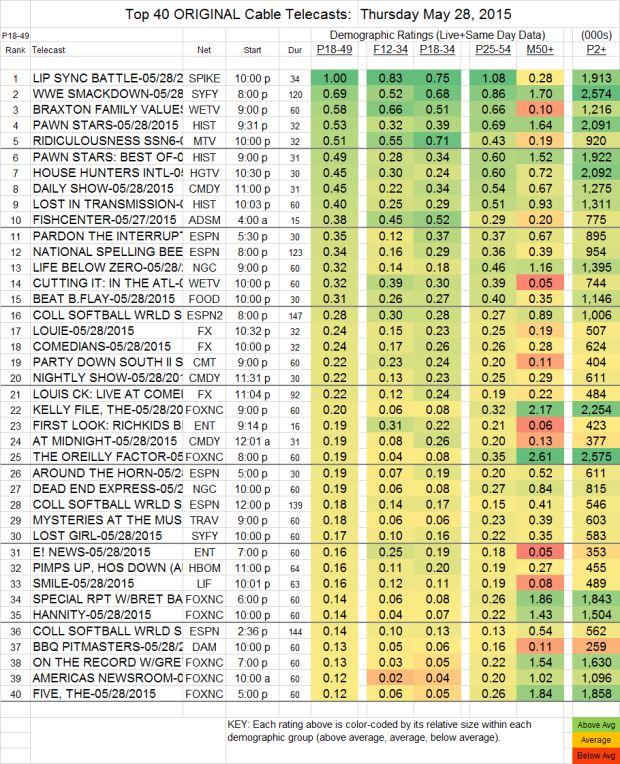 Syfy’s WWE telecast slipped 0.02 to 0.69, then LOST GIRL fell 0.06 to 0.17, and OLYMPUS dropped by half, down to 0.09. On We, BRAXTON FAMILY VALUES downticked to 0.58, and CUTTING IT IN THE ATL fell 0.07 to 0.32. History’s PAWN STARS was at 0.53, with a lead-in clip show at 0.49, up from 0.49/0.42 last week, and LOST IN TRANSMISSION grew by 0.05 to 0.40. RIDICULOUSNESS (MTV) rose 0.05 to 0.51. HGTV’s HOUSE HUNTERS INTERNATIONAL was at 0.45. At 4AM, FISHCENTER (Adult Swim) was at 0.38. The night’s major sporting event (so to speak) was the NATIONAL SPELLING BEE on ESPN at 0.34. On FX, LOUIE and THE COMEDIANS were both at 0.24, respectively up 0.03 and 0.06. Bravo’s REAL HOUSEWIVES OF MELBOURNE slumped by 0.08 to 0.10. MARON (IFC) doubled last week’s number to 0.06, and upped its total viewers to 27K to 120K.